Anne Arundel County Executive Steve Schuh, right, and other county officials took to kayaks Friday afternoon. They paddled three miles from the Beverly Triton Beach Park on the Chesapeake Bay to a boat ramp on the Rhode River to illustrate Schuh's plans for increasing public access to the bay and its rivers. Anne Arundel has 530 miles of coastline, the most of any county, but only one public boat ramp for 14,000 trailered boats registered in the county. Schuh put $592,000 in his budget to plan and develop eight new free public boat ramps in the county. Veteran kayak Ralph Heimlich, left, using a Greenland wooden paddle, towed Maryland Reporter the last half of the 90-minute trip. HEROIN TASK FORCE RECOMMENDATIONS: Maryland will add treatment beds for heroin addicts on the Eastern Shore, boost law enforcement efforts to disrupt dealers and launch a public-awareness campaign about the dangers of addiction as part of an initial state response to a growing and deadly overdose epidemic, Josh Hicks is reporting for the Post. Cautioning that there likely would never be enough money to fix Maryland’s heroin problem, Lt. Gov. Boyd Rutherford said Tuesday that a state task force recommends an expansion of treatment and prevention efforts to begin addressing it, Jean Marbella reports in the Sun. Tamela Baker of the Hagerstown Herald Mail reports that four of the task force’s recommendations involve the Maryland State Department of Education. Among them: developing age-appropriate lessons and resources on heroin and opioid use and creating service-learning, curriculum-based projects. The recommendations, however, were met with sharp criticism from Michael Gimbel, the former head of substance abuse programs in Baltimore County and a former heroin addict, who called the recommendations “Task Force 101,” reports Bryan Sears for the Daily Record. Gimbel said the recommendations and spending focus too much on prevention and treating overdoses and not enough for treatment. Hogan surprised lawmakers and local officials on July 30 when he announced that he had instructed Stephen T. Moyer, the corrections secretary, to begin the closure of the Civil War-era facility immediately and the transfer of its 750 pretrial inmates, Ovetta Wiggins of the Post reports. LEGGETT RECOUNTS POLICE HARASSMENT: Montgomery County Executive Ike Leggett, endorsing guidelines issued Tuesday by Maryland Attorney General Brian Frosh directing police to avoid racial profiling, told reporters the problem is real. Leggett, who is African American, said he was harassed by a police officer in Silver Spring as recently as November. He appeared with Frosh and others Tuesday at a news conference in Annapolis to introduce the guidelines developed by Frosh to end discriminatory policing, Michael Dresser reports for the Sun. SPURRING OYSTER FARMING: Maryland’s fledgling oyster farming industry is seeing its growth hampered by government red tape and permitting delays, several aquaculture business owners told state and federal officials Tuesday. At a session organized by U.S. Sen. Ben Cardin, oyster farmers said that despite some regulatory streamlining several years ago, they still often face waits of six months to as long as eight years in getting needed government approvals to lease water or bottom in Chesapeake Bay tributaries, Timothy Wheeler reports for the Sun. Anne Arundel County Executive Steve Schuh, in blue kayak, and other county officials took to the water Friday afternoon. 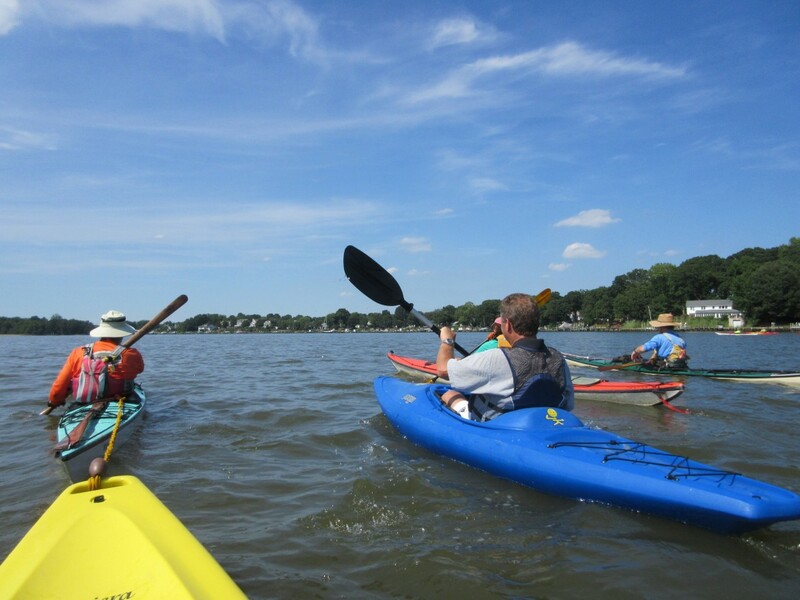 They paddled three miles from the Beverly Triton Beach Park on the Chesapeake Bay to a boat ramp on the Rhode River to illustrate Schuh’s plans for increasing public access to the bay and its rivers. Anne Arundel has 530 miles of coastline, the most of any county, but only one public boat ramp for 14,000 trailered boats registered in the county. Schuh put $592,000 in his budget to plan eight new free public boat ramps in the county. Veteran kayaker Ralph Heimlich, left, using a Greenland wooden paddle developed by the Inuit people, towed the Maryland Reporter the last half of the 90-minute trip. REGULATORY REFORM: Randolph May of the Free State Foundation lauds Gov. Larry Hogan for undertaking regulatory reform, adding that not all regulations are bad and need reforming. But, he writes for MarylandReporter.com, the state needs to focus on the regulatory process and more frequent review of regulations. JOBS NUMBERS UP: Daraius Irani, of the Regional Economic Studies Institute of Towson University, in a commentary for MarylandReporter.com, writes that jobs numbers released Aug. 21 gave Marylanders a reason to celebrate this past July’s activity. The revision of the June job numbers moved figures from an initial loss of 6,200 jobs between May and June to a loss of 3,400 jobs. However, July preliminary job estimates reported a 9,200 job increase from June to July. LATE HISTORIAN HONORED: Maryland State Archives in Annapolis will be honoring Lois Green Carr, a pre-eminent scholar of the Colonial Chesapeake region before she died June 28 at the age of 93. In 1956, Carr began work at the archives, then located on St. John’s College campus. In 1967, she became the historian for Historic St. Mary’s City, a position she held 45 years, mostly working from the archives. She led research to document the lives of every known 17th-century St. Mary’s resident, Tim Prudente writes for the Annapolis Capital. PRESIDENTIAL POLLING: Fraser Smith and Mileah Kromer, of the Sarah T. Hughes Field Politics Center at Goucher College, discuss the latest polling from Iowa and what that means for Gov. Martin O’Malley’s presidential chances. LEAD PAINT GRANT: Rick Ritter of WJZ-TV reports that the U.S housing secretary announced a $4 million grant for Baltimore City to help children who live in low income houses and are at risk of lead poisoning, to help screen hundreds of families at risk of lead poisoning and fix up their low income homes. MANUFACTURING TAX CREDIT: A tax credit that could last up to 10 years for new and expanding manufacturing businesses in Frederick County is under consideration by the County Council, writes Paige Jones for the Frederick News Post. The proposed commercial and industrial tax credit would be available to manufacturing, fabricating and assembly businesses expanding in or moving to Frederick County. To qualify for the tax credit, businesses must invest at least $5 million and create 25 full-time jobs, according to county documents.